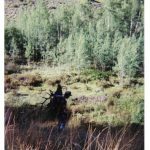 It’s 1992, and I’m Inhaling the crisp mountain air while stumbling up an incredibly steep cow path on the far side of a box canyon in the darkness of an early September morning, not knowing what to expect when I reach the top of the hill. Although my father and I briefly saw from a distance what we thought was a bench on the top of the hill last fall, I don’t know what it looks like on that bench since I have never been there. As I get closer to the top, I can see a bit of open air through the darkness, just enough to know that my climb is almost over. My father is a few steps ahead of me, and we are both starving for oxygen. Our lungs have just about reached their capacity at 11,000 feet, after all, we left New York a few days earlier, where the elevation in my hometown is less than 1,000 feet. Breaking into the open at the top of the ridge, frost greets our boots, and we shuffle through the grass to sit on a fallen log. Just as we had anticipated, the bench is full of small meadows in every direction. Although it is still dark, a grove of aspen trees can be seen down the hill in front of us, and a drainage extends into blackness — an eerily peaceful darkness that holds the keys to the adventure that awaits us. We sit quietly and wait. Wanting more light to navigate, we hope to hear a distant bugle or maybe even a few cows and calves chirping somewhere in the near vicinity. Instead, a coyote howls on the next ridge, which excites a few small bulls and gets them singing……………one bugle, two……….and before I know it, five different bulls are bugling and creating their own symphony that echoes across the canyon walls. Having never experienced anything like it, we make a quick game plan and decide to split up. I’ll go after one of the bulls on the next ridge, and my dad will follow the aspen grove toward the mountaintop to chase the ones that are sounding off in that direction. Hopefully, one of us will be presented with an opportunity to put an arrow in flight. Well, the morning I described took place 26 years ago next week. 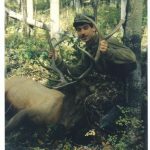 It was my first trip to Colorado to hunt elk with a bow. Although I had gone the year before with a rifle, I had never tried my hand with a bow. Five of us went on the trip, including me, my dad, two of his buddies from New York, and a guy from Maine; we were all greenhorns. We didn’t know the first thing about elk hunting, elevation, hydration, good footwear, perfectly tuned bows, or good backpacks. Instead, we just knew that we had to have more grit and determination than everyone else, and maybe, just maybe, we would get a shot at an elk. 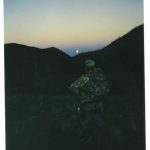 A few days later, I crested the same ridge and heard bulls bugling in the far drainage, so I decided to go after them. After a few aggressive bugles out of my Quaker Boy bugle tube, I could hear him coming. Seconds later, I could see his antlers, then his entire body appeared in front of me. Searching for his competitor, he turned broadside at 15 yards and put everything he had into a hair-raising bugle. I drew back my 80-pound tree-bark camo PSE Fire-Flite Express and settled the pin behind his front shoulder as I watched the breath creep out of his mouth and extend into the air like he was smoking. Applying steady pressure on the trigger of my Cobra caliper release, I was startled when the bow fired. Expecting it to go through his vitals, I was stunned as I watched the arrow harmlessly sail over his back and fly into the nothingness over the hill where he stood. How had my preparation during my 3D shooting failed me? How did I miss something the size of my Izuzu Pup truck at 15 yards? Reaching toward my hip quiver, I grabbed another 2216 Easton Gamegetter II and nocked it. As the bull now stood 40 yards away, he didn’t let up as he found his way into another bloodcurdling scream. I slowly drew, anchored, settled the 40-yard pin behind the shoulder, and squeezed the trigger. Watching the arrow travel in slow motion toward the majestic king of the mountain, time stood still. As it reached its peak in the arc and began coming back down, my focus remained on the spot where the pin was last seen when I looked at it through my peep sight. Jarred out of the serenity of the slow-motion film I was watching, all hell broke loose, and I could hear the bull gasping for air. His hooves clanked like a thoroughbred’s hooves pound the dirt while headed down the homestretch. A tremendous crashing noise followed, then all was quiet. A magpie sensing it might have a free meal began chattering with its buddies, and before long, six of them filled the top of an evergreen tree in the meadow. As they squawked back and forth to determine their rank, another bull began screeching further up the drainage, but I was done and had a lot of work in front of me. After meeting with my dad and going back to camp, we got help from the rest of the guys and headed back to take care of the bull. Although we made quick work of it and began packing it out, we weren’t fully prepared…………….we only had a few frame packs…………………and a very big duffle bag. Yes, we stuffed everything into the frame packs and duffle bag and began the journey down one side of the box canyon and up the other side. When we finally rolled back into camp, it was 10:30 p.m.
We have come a long way since that day – that year. I guess everyone learns as time passes. Hopefully, people grow and figure out better ways to do things. In the years that followed, we stacked up some elk, including bulls and cows, and never looked back. Many people have graced our presence, and for the most part, we have presented everyone with an opportunity to take an elk. 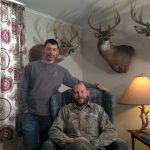 While many have succeeded, many have not, and we have a lot of fantastic memories stored away from successful and unsuccessful hunts alike. Why do I tell you all of this? It’s because this year, next week, I will be starting all over. I’ll head back into that same area where I killed my first bull, but this time, I’ll have someone tagging along behind me with a camera in tow. No, it’s not what you think. This isn’t for a hunting show or a hunting video. This will be the culmination of the project I’ve been working on with Alex Kershaw for the last handful of years. His project, which originally started as a visual art compilation, has now taken on more of a documentary type feel, but not like the documentaries you are probably envisioning. This particular documentary probably won’t have much talking, if any, and it examines a hunter’s intimate relationship with the outdoors, the animals he pursues, and the death of the animal that is killed. All of these things are interwoven into a tale that can only be told in this particular way. This isn’t a film directed toward hunters – or anti-hunters. It’s a film that explores something that very few people ever think about, especially people who don’t hunt and people who don’t become truly immersed in the hunting experience. This year will be tough because Alex isn’t a hunter and doesn’t have the experience that is necessary to remain undetected long enough to get within bow range. I agreed to let him film this hunt to get some of the stuff he really needs to finish the project. I’ve taken enough elk over the years, which makes me no longer feel the need to get something to feel successful. Along the way, I have realized that I have nothing left to prove to anyone. Instead, I enjoy the journey a lot more now than I ever have in the past. Many people never get to that stage in their hunting careers, but I’ll be forever thankful that I had a great role model in my father to show me the way and make me understand how our thoughts and outlook change as we age. Father Time doesn’t slow down for everyone, and he’s undefeated in the game of life. If we can accept him when we finally realize he’s no longer running beside us, but walking with us, the time we spend doing the things we love will enrich our lives and everyone’s lives around us. I guess this is my way of telling you that this trip will be an adventure unlike any I have ever had in my life, and I look forward to being a part of Alex’s adventure, because I am sure that this will be new for him, too. 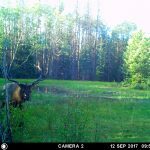 Hopefully, we get some good footage that can only be captured in elk camp amongst my friends and family. After all, that’s what hunting is all about, even though so many people in this social media era have failed to acknowledge it or even understand it. I’ll update the journal on my website after I return. Please enjoy the journey when I share it with you. Have fun in the outdoors and make your memories everlasting. This entry was posted on Thursday, August 30th, 2018 at 6:52 pm and is filed under Uncategorized. You can follow any responses to this entry through the RSS 2.0 feed. You can leave a response, or trackback from your own site.